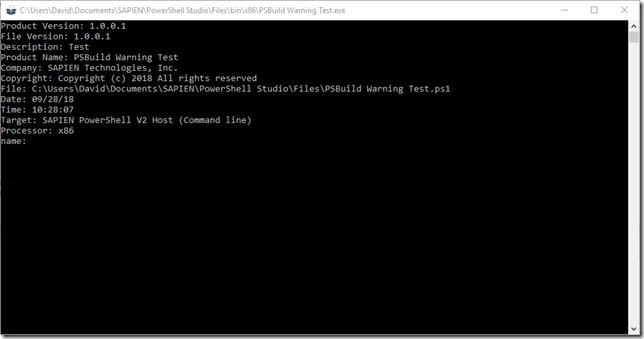 We released a new service build of PowerShell Studio 2018 (v5.5.155). This service build is included as part of the regular update cycle for our subscribers. 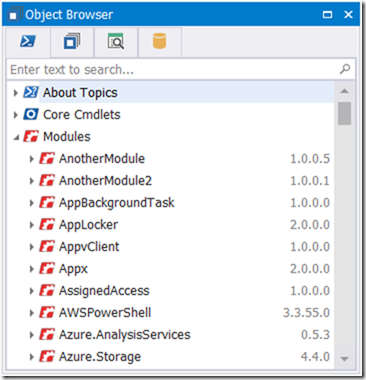 This service release introduces new features such as Scope Highlighting and updates PowerShell Studio’s ribbon to surface hidden features. The most notable change with this build is the redesigned ribbon. We update the ribbon’s Home tab in order to surface hidden features and moved features from the Tools tabs over to the Home tab. The Custom Tool menu was moved to the Run group to make it more accessible. The biggest change involves the Edit group. New menus have been added to surface new and existing features, and some functionality has been relocated from the Tools tab. We copied the Sign Script menu over from the Tools tab. 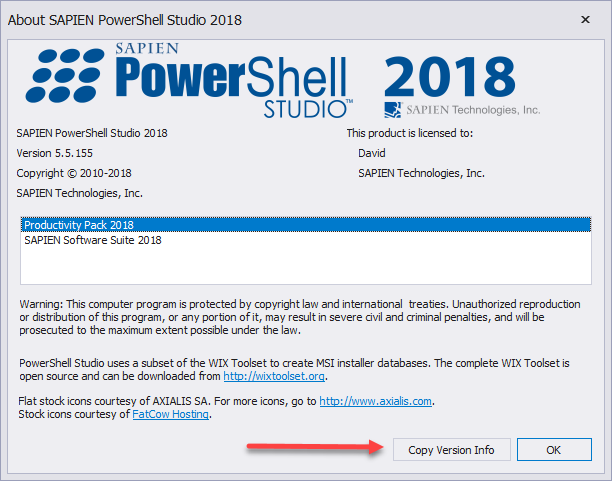 Use this menu to sign your scripts or remove an existing signature. We added an Analysis menu that contains the commands located in the Analysis group of the Tools tab. The new Convert menu contains commands that transform your script in one way or another. Converts the current character or selection to uppercase. 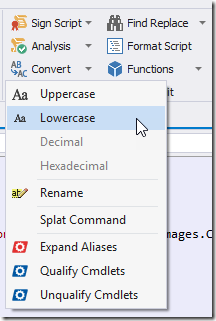 Converts the current character or selection to lowercase. Converts the selected hexadecimal number to a decimal number. 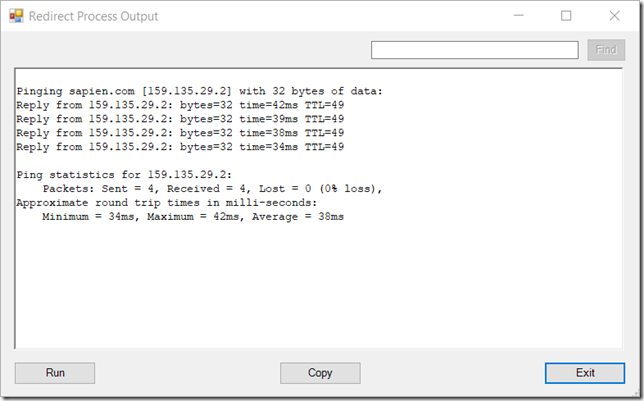 Converts the selected decimal number to a hexadecimal number. 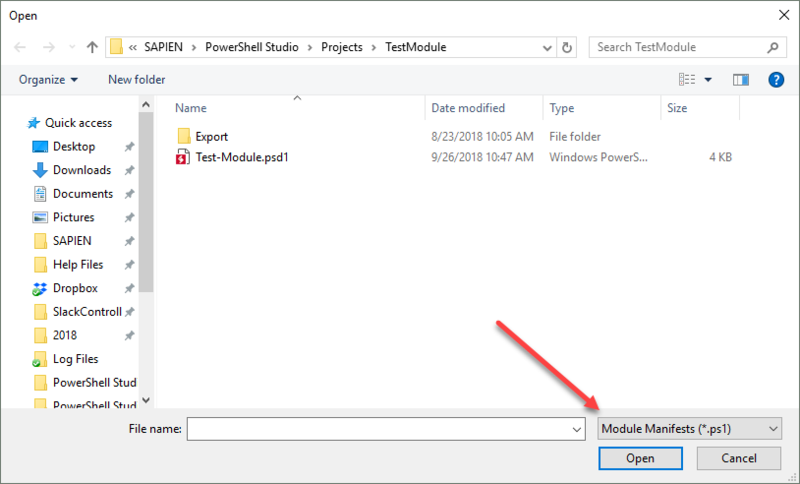 Renames the references of the selected object or command. Splats the parameters of the command. Expands all the aliases in the script. Renames the cmdlets in the script to use the fully qualified (ModuleName\CommandName) name. Renames fully qualified cmdlets in the script to use their short name. Copied over from the Tools tab. Search multiple files for specific text. 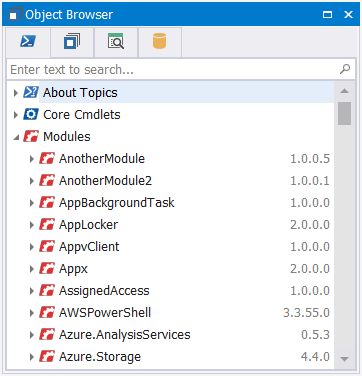 Finds all the references of the object / command within the script or project. The assemblies command has been moved into this group. 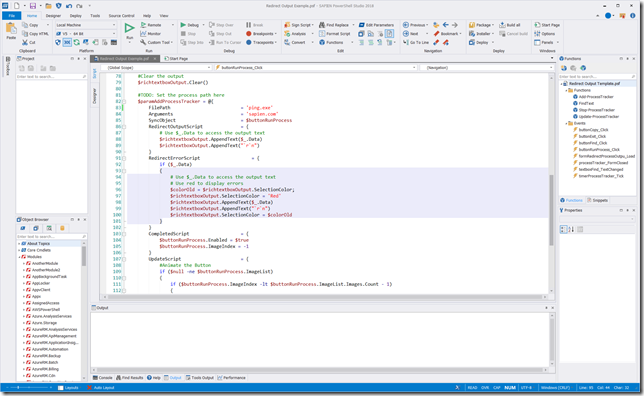 The assemblies dialog allows you to select external assemblies to be imported by the script and PowerShell Studio’s PrimalSense™. Copied from the Tools tab. 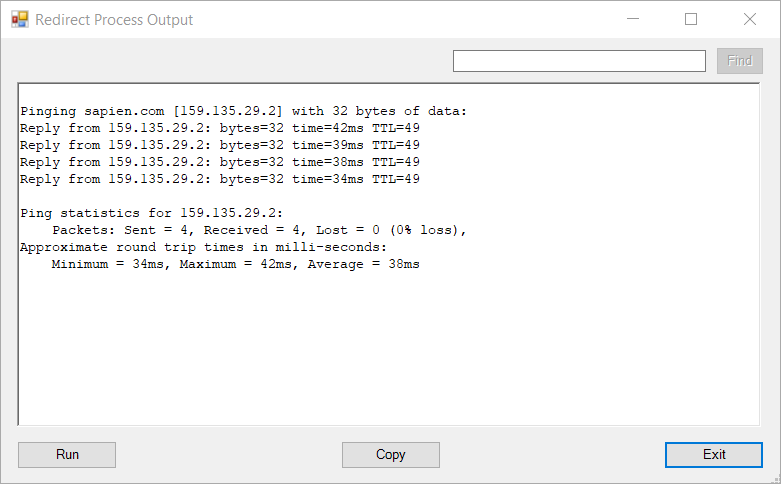 Compare the script with another file. Generates commend-based help for the selected command. This button toggles the new Scope Highlighting feature, which is covered below. When editing scripts, sometimes it is necessary to determine the scope of a script block. To determine this, previously you had the option to use the bracket highlighting to find the matching opening and closing bracket—but doing this requires you stop what you are doing and unnecessarily move away from the line you are editing. With the new Scope Highlighting feature you can visually determine which is the scope you are currently editing, without having to scroll or leave the line you are editing. Since the option is surfaced on the ribbon, you easily enable or disable this feature when necessary. This build updates some existing control sets. We updated the process tracker control set, to allow you to redirect the output of external processes. 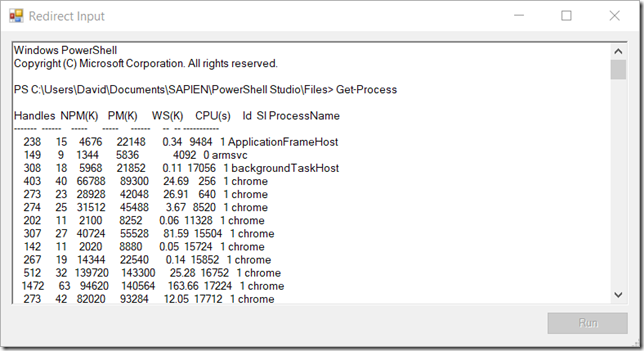 The Add-ProcessTracker function has several new parameters to facilitate output redirection and gives more control over whether or not the process is displayed. 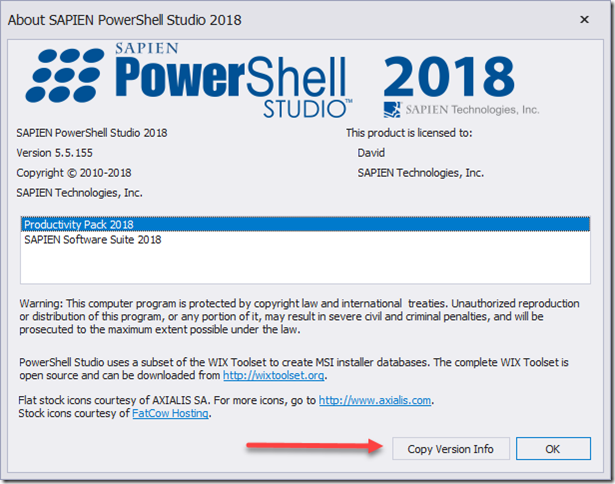 A special thanks to James Vierra for demonstrating to a PowerShell Studio user how to redirect the output of a process in a GUI, which is the reason for this update. The script block that handles output from the process. 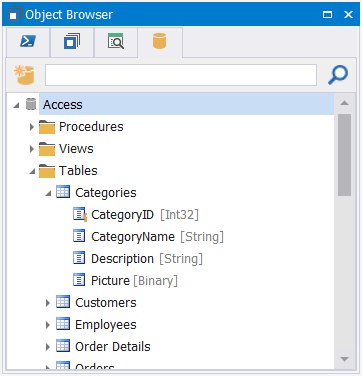 Use $_.Data to access the output text. 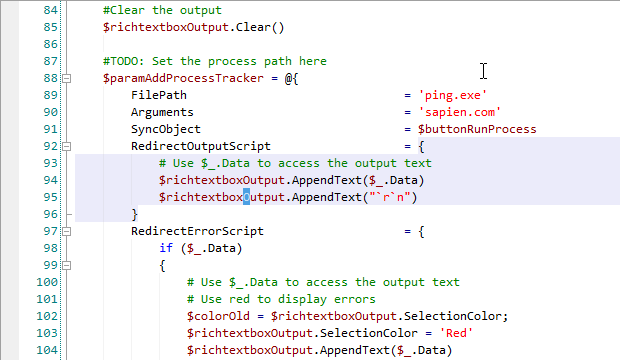 RedirectErrorScript The script block that handles error output from the process. 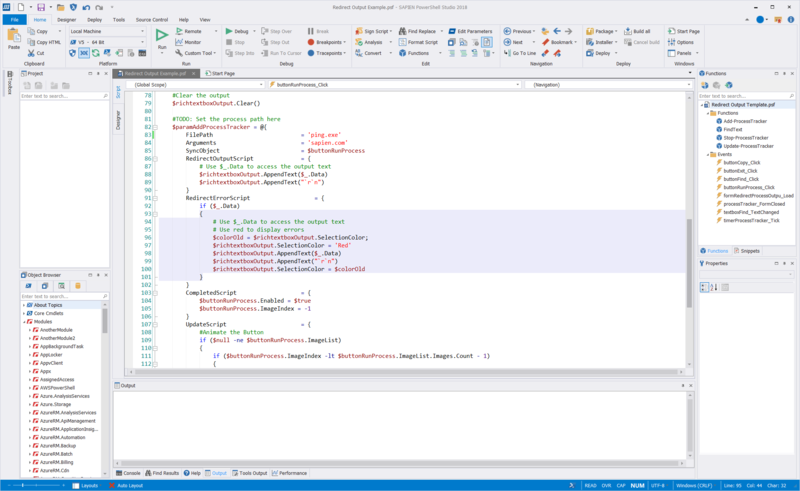 NoNewWindow Start the new process in the current console window. WindowStyle Specifies the state of the window that is used for the new process. Valid values are Normal, Hidden, Minimized, and Maximized. WorkingDirectory Specifies the location of the executable file or document that runs in the process. RedirectInput Redirects the input of the process. If this switch is set, the function will return the process object. 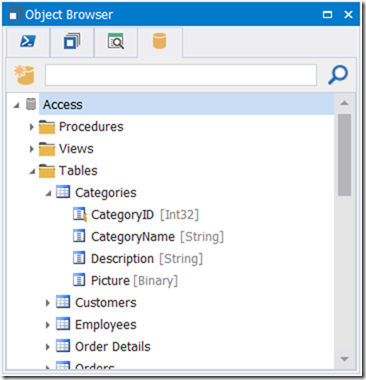 Use the process object’s StandardInput property to access the input stream. PassThru Returns the process that was started. SyncObject The object used to marshal the process event handler calls that are issued. You must pass a control to sync, otherwise it will produce an error when redirecting output. 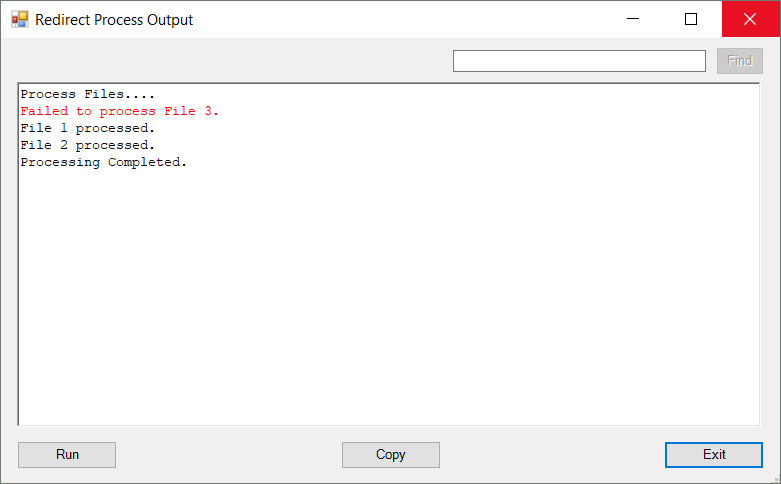 This new GUI template uses the Process Tracker to redirect and display the output of an external process using a textbox. 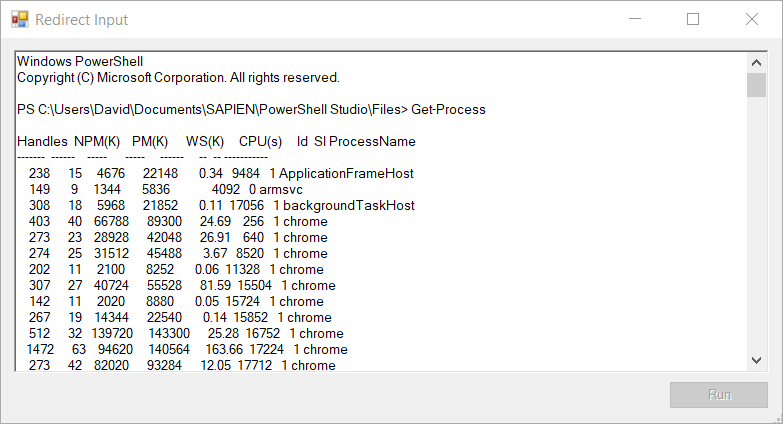 Any process error output is distinguished in red. The Git provider now has All variants to applicable commands. In addition, the Universal Version Control commands now support tooltips. Project and form build messages are now displayed in the Tools Output Panel. 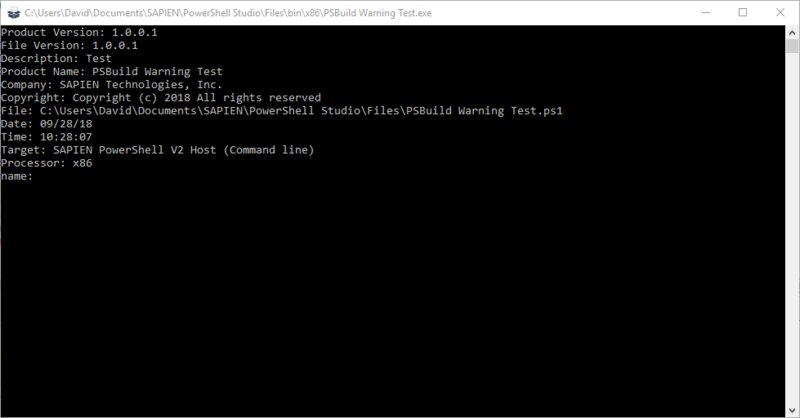 Moving the build messages to the Tools Output panel allows the Output panel to focus on script output. There is a new snippet Get-ScriptName. 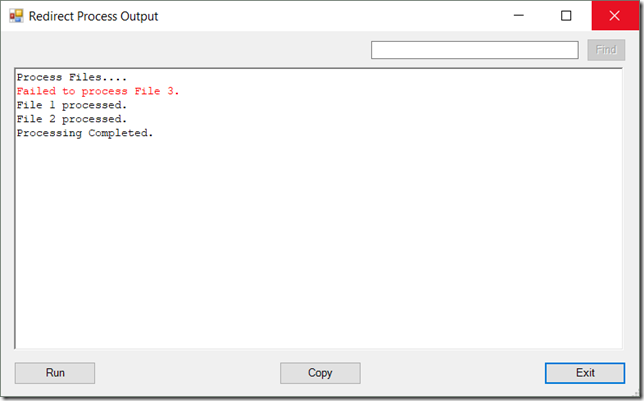 The script inserts a function that returns the name of the script or package executable. This build introduces new additions to the packager. The MSI builder can now pull the version information directly from your module manifest. If the script has a #requires version higher than the packaging engine target. 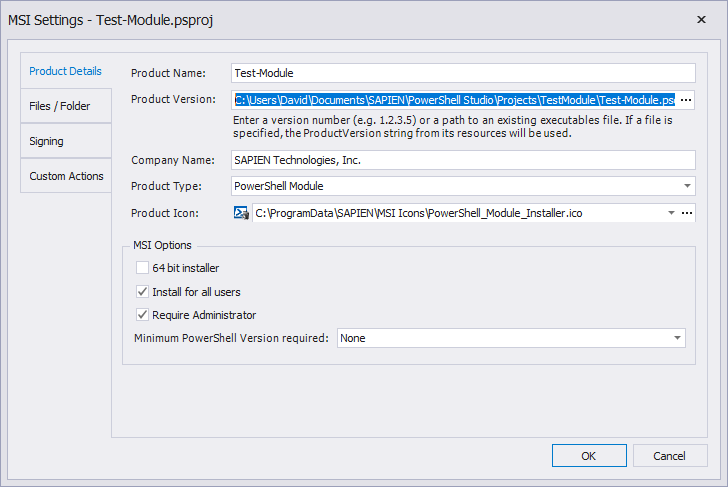 If the script has a #requires statement that specifies PowerShell Core. 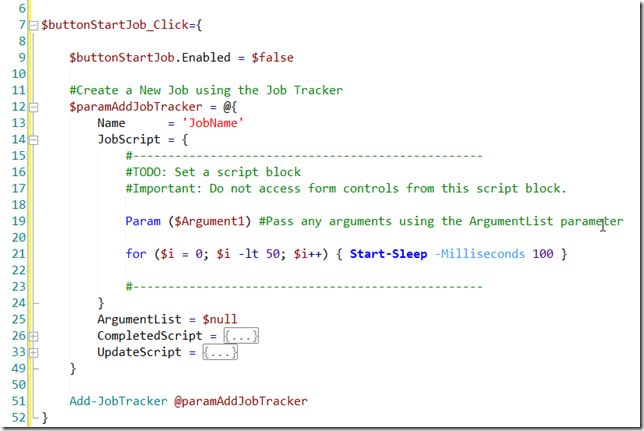 If you are using a switch statement in the script’s parameter block. If the script contains #requires -RunAsAdministrator and the a elevation manifest is not selected. Agree with Tom… as great as these updates are, you guys really need to get multi-select working. Anytime I need to do a lot of text replacements I end up copying everything to SublimeText, making edits there, then coming back to PS Studio to check the changes.